Find soundproof curtains. Soundproof curtains act as a barrier, preventing the spread of noise. Plus, you can find ones that fit in with the décor in your home. That’s right—they’re a helpful and stylish way of soundproofing your apartment. Add a pad beneath your rug. To downstairs neighbors, it may sound like their upstairs neighbors are marching every minute of the day. However, there’s an easy—and nearly invisible—fix: adding a pad beneath your rug. Then, nearly all noise will be muffled. Wear socks or house slippers. It turns out that changing up your fashion can help soundproof your apartment. By wearing socks or house slippers, you can decrease the amount of noise you make while walking. Put scratch guards under furniture. Putting scratch guards under table and chair legs serves two purposes. First, it protects your floors. Second, the act soundproofs your apartment, allowing you to move furniture without causing a disturbance. Soften up floors and walls. Did you know that adding a bit of fabric to your floors and walls, like laying down a rug or hanging up a tapestry, can decrease how far noise spreads? If you were looking for an excuse to redecorate, now you have one! Use furniture as a barrier. Sound can travel through walls. Fortunately, you can help block it by using furniture as a barrier. Adding a tall dresser or bookcase against your wall will help you muffle noise. Plus, you can enjoy more storage with this tip too! 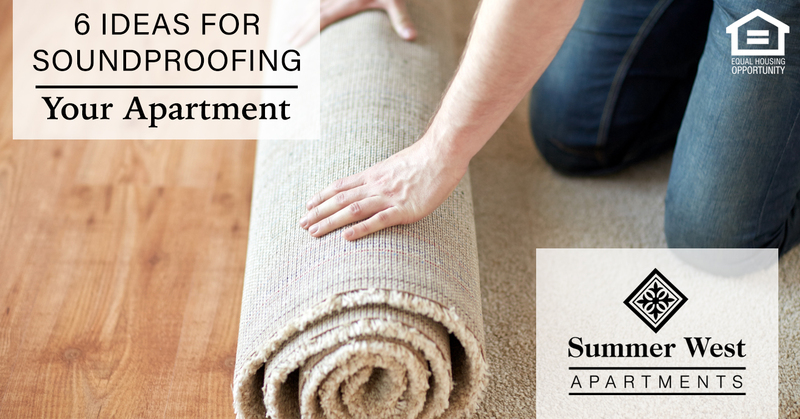 With a little work, you can tackle the task of soundproofing your apartment without making permanent changes. Your neighbors will appreciate the consideration, and you’ll love the peace and quiet. If you’re looking for a comfortable apartment and a great community, it’s time to head over to our website. You can also call Summer West Apartments at 601-264-6955. As for learning more about apartment living, check out our blog. This entry was posted in Apartment Rentals, soundproofing your apartment, Summer West Apartment and tagged soundproofing your apartment. Bookmark the permalink.